One of the trickiest countries that tourists can travel to without spending much is Thailand. We are happy to announce to you the thing you needed for a Cambodian trip. The Baht is the official currency of Thailand, and it is available in coins and notes. There are two different versions of banknotes presently in circulation in Thailand which look somehow looks different, but both are legal. On the back of the bill is one is the Thai King Is；One of the banknote versions portrays him in military uniform while the other displays him in a traditional dress. Thai currency should be treated with respect because it bears the King's image - which is held in very high regard. Bear in mind that bringing an excess of $15,000 or its foreign currency equivalent into Thailand requires that you declare it to the customs officers at the border. Although carrying a surplus of $15,000 into the country is not illegal, but you have to be ready to answer some question about the sources of the vast amount of money and what you plan to do about it. Thailand's big businesses, hotels, and restaurants accept all major credit and debit cards. Meanwhile, you might find out that some small business establishments don't take cards. For this reason, make sure you have all cash on you at all time. Likewise, inform your bank in your country before you embark on your Thailand trip because some financial institutions will be suspicious once they notice the external use of your ATM card. That's why you have to inform them ahead of your Thailand trip. Otherwise, your card may be blocked by anti-fraud software, and that may cause great inconveniences. It is advisable to exchange your cash when you get to Thailand because will try to buy you in with 'Commission-less' or 'Zero Charges' proposals. Generally, you will enjoy a better THB exchange rate in Thailand in ny9our own country. 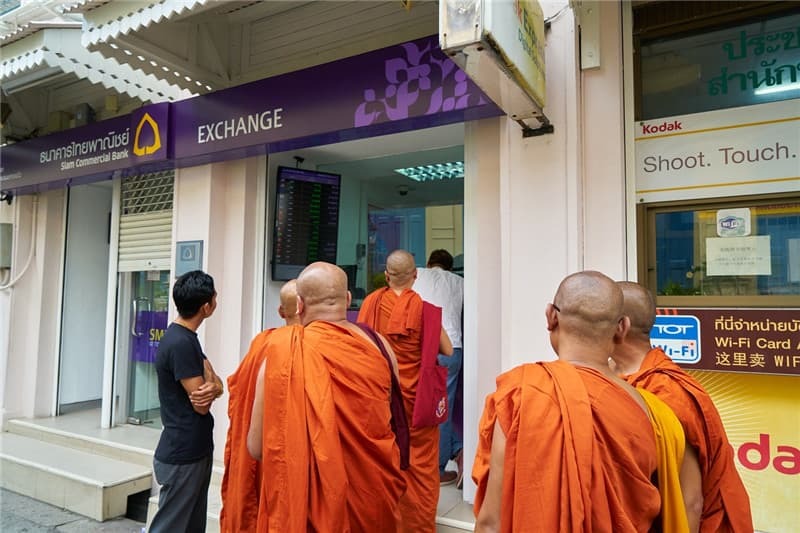 Exchange services in Thailand offer 'zero commission' but ensure you can see the exchange rate on offer. Usually, when services advertise a package without commission or levies, their profit is cleverly embedded in the poor exchange rate they propose. Deciding which exchange service to use is easy enough as long as you understand the mid-market rate. This is the only better exchange rate and should be used to compare the exchange rates available to tourists. Find out the current mid-market rate is by using a currency converter online - that will help you determine whether a deal is fair or not. There are currency exchange desks in international airports and hotels which make changing cash on arrival seem comfortable. However, exchange rates in these locations are notoriously weak, so make sure you're pleased with the deal before you accept. If possible, exchange only a small amount and seek a better deal in town. Alternatively, there will be ATMs available which allow you to withdraw some Baht to tide you over. There are several ATMs in Thailand. Cash is the preferred method of payment for most Thai people, so using an ATM to make withdrawals can be a convenient option for tourists. Check the foreign fees charged by your home bank and check if they have any partners in Thailand. Using your ATM abroad can attract charges from your home bank as well as the ATM operator. Confirm with your local bank before you leave what their fees are and if they have any arrangements with Thai banks to allow you to get access to services more cheaply. Bank-owned exchange counters are widely available in tourist zones, from airports down to night markets. Their exchange rates are similar to what majority of the credit card companies will charge you for either payments or withdrawals in a foreign currency. This is not as good as what a debit card gets you, but at least there's no extra fee. It's an acceptable alternative if you only exchange a small amount of money.